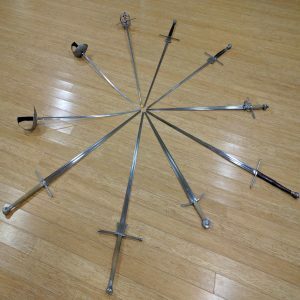 In HEMA we spend a lot of time talking about how we can learn new techniques, and use the techniques we already know more effectively. But studying a martial art is a collective activity, and we depend on each other for the quality of our learning. If everyone’s learning experience is awesome, we all learn faster! Here are some ideas for being a more effective drill partner. Martial arts are inherently dangerous, but we can and should try to minimize the risks. [Your training partners] give up their own training time to help you with problems. They allow you to hit them, repeatedly, so that you can learn a new technique or skill. They moderate and control their own strikes so that they do not damage you, even though they may have the capability to do so. This is a critical point: they respect you enough to look after you, keep you safe and help you learn, even if they would enjoy practising harder or faster or with someone better. That deserves some respect in return. Keith’s article outlines what to consider when choosing a weapon to train with, and when selecting protective gear. Essentially, use training weapons that won’t injure your partner or expose them to unnecessary risks; and use protective gear that allows your partner to execute techniques effectively against you. Maintain martial intent in your drills to preserve a sense of realism, and make sure that techniques will work against a genuine threat. When you make a cut or thrust at your drill partner, make sure it will actually hit them! If your attacks are out of distance, you are not helping your partner to learn. Check distance before you start your drill. Know the distance you’re supposed to be working at and maintain awareness of it. Pause between repetitions and “reset” your mind and body. When you’re initiating the drill, vary the amount of time that you allow to elapse between repetitions so that your partner must respond to you rather than acting on autopilot. Break up the rhythm and make sure you and your training partner are responding to each other, rather than performing a sequence of movements automatically. Don’t pre-empt your partner’s actions – respond to them. You can’t “win” a drill. When it’s your partner’s turn to practice a technique, think of yourself as their teacher, rather than their opponent. When your student successfully executes a technique against you, you’ve done your job correctly! Likewise, when you walk out of a class having learned a new technique, you have your training partner to thank for that. She deserves the same experience. Make sure you’re not beating the drill. Provide sensible resistance, so that your partner needs to use martial intent and correct technique in order to succeed. But don’t step outside the boundaries of your part of the drill. If your role is to parry once and then get hit on the head, do that. Don’t parry twice. If your partner’s technique is consistently failing, consider the possibility that you could be doing your part of the drill incorrectly – perhaps by moving too quickly, or taking some action that isn’t part of the drill. When your instructor or a senior student explains a drill, make sure you understand what you’ll need to do when it’s your partner’s turn to practice the technique. It’s just as important to provide the correct stimulus for your partner as it is to get the technique right. Even when your part in a drill is very simple, such as initiating with an overhead cut for your partner to defend against, there’s still a lot to get right: Distance, cutting angle, making sure you lead with your sword instead of your body, etc. Instead of zoning out until it’s your turn to do the thing, use the time to hone your own technique. Your drill partner is letting you strike them – you have a responsibility to do so respectfully, and with control. My antagonist initiates the drill with a cut to my left temple. My job is to use correct timing and blade angulation to counter-cut through her attack, and without parrying, strike her head. This is a technique for a specific situation: When my opponent attacks me with a true, direct strike that is intended to hit my head. For this technique to work, my antagonist must throw a proper cut at my head. If my training partner is performing her part of the counter-cut drill correctly, I should have no problem making this technique succeed. I may need to clean up my timing and cutting angle a bit, but once I’ve done that, a counter-cut should be a reliable technique against this particular stimulus. A problem arises if my training partner is not delivering her cut at a consistent angle with proper intent to strike my head. In a previous section of this article I discussed staying honest – part of which involves making sure you deliver genuine attacks for your partner to deal with. However, if I repeatedly strike too hard during the counter-cut drill, my training partner will stop making genuine attacks. She will instinctively start to throw parries instead of cuts, in order to protect her head. My counter-cut will likely “stop working”, since my partner’s initial stimulus is now different – and requires a different response. If I then decide that my counter-cut is failing, without understanding why, I may be tempted to strike harder, or faster – making the problem even worse. To avoid this, I need to make sure I’m landing my counter-cut with enough control that my partner can safely put up with having it done to her twenty or thirty times in a row. A fencing mask does not make my training partner invincible. I still need to control my strikes. We can help to keep our drills running smoothly by checking in with each other. Do you both agree on what the drill consists of, and what to expect? If not, clarify with your instructor or a senior student. Are the speed and level of contact appropriate? Are you both getting enough repetitions of each component of the drill? Sharing insights is also really valuable. What can you learn from your training partner, even if they’re less experienced than you? How can you help them learn more? Training is hard work, but it should also be fun. Apart from keeping yourself and your partner as safe as possible, this is the most important part of all! Remember why you started training with a sword. New students are an endless source of inspiration because they are excited to learn techniques that more experienced students may find mundane. Swords are awesome and you should feel awesome.